I don’t think he knew the impact his words would have on my heart, and I don’t believe he realized he was indeed placing a challenge before me. sitting in a committee meeting (awww…those glorious church committee meetings), his comment became a prayer point and a question I would lay before the Father over the next few weeks. After much prayer and a lengthy conversation with Justin and Chelsea, the idea of F. A. T. Girls Bible studies began. Now… the F. A. T. (Faithful. Available. Teachable) tag is not unique to me. It was not my brain child, but it was something Chelsea mentioned she had heard about. In my heart and mind, God birthed this idea of teaching women of all ages how to study the Bible for themselves. It’s a small idea with big…kingdom… repercussions. I hope. As followers of Christ… Bible-believing followers, we are surrounded by Christian bookstores which pedal a myriad of books on everything from devotionals and topical Christian nonfiction to workbook-based Bible studies covering specific topics relating to women and some individual books of the Bible. Some of them…many of them, in all honesty, are fluffy. They seek to find girl-friend status on your bookshelves. They make Bible study and “knowing God” a soft place…comfortable. It’s not. In truth, after spending most of my adult life not only participating in these types of women’s studies, but also teaching them, I found myself starving for real encounters with the Word of God and yes…even God Himself. I realized there was a ridiculous amount of commentary… personal stories… girl-friend mentality pandering even… to these studies. And while the studies were and are not bad, they left me with a mountain of questions and a horrible sense of inadequacy with regard to the study of God’s Word. I needed something more, and my conversations with more seasoned believers led me to a couple of tools, people, and places. I took my first Precept Bible study class at a sister-church in town. Precept Bible Studies are the life-long project of Kay Arthur. Honestly, the Precept classes taught me to dig in God’s Word. Repetitive readings and marking the Scripture were an essential part of my growth in these studies. The Covenant study was my first Precept class, and it was life changing. I began teaching an adult Sunday School class without a quarterly, but focusing on a book of the Bible, digging and preparing by completing the Precept class prior to teaching. The gift of a trip to Israel and the blessing of an opportunity to attend seminary changed my life and rewired my heart and my mind. I became a woman passionate about teaching others to study God’s Word for themselves…to know God’s Word bone marrow-deep. Over the past few years, I began to read the writings of other Godly teachers, Jen Wilkin and Nancy Leigh DeMoss Wolgemuth, just to name two. I began to listen to and follow theology-based podcasts. I completed many of Jen Wilkin’s free online studies through her Flower Mound studies. I read a crazy amount of books on how to study the Bible, looking at what worked for others, but mining the strategies that worked best for me. I invested in a solid Bible Dictionary and an Exhaustive Concordance. Prayerfully, I listened to and read the Bible deeply, asking for wisdom and discernment, hungry to know truth, but more importantly, trusting that daily I was growing bit by bit in the knowledge of the God who made me and wired my fickle heart. Hungry was and is the way I describe myself, which is why the mnemonic use of F. A. T. appealed to me. I believe that we must come to the study of God’s Word hungry to know Him, faithful in our approach, making ourselves available to Him and the study, and most definitely teachable and open to the Holy Spirit. last January, I posted a random question about women who were hungry to study God’s Word, and a Bible study was born. Our Thursday night group became the sweetest gift to me. Thank you, Jesus! F. A. T. Girls Bible study is easily one of the greatest adventures God has ordained in my life. So now, we are adding another group, and I am going to use my blog and Facebook presence to continue what God has started. Beginning this week, I will share our study with those who follow this blog in hopes of encouraging more women to DIG deep in the study of the Bible, but more importantly, in their desire to know God through His Word. Join us as we begin the study of 1 Samuel. P.S. Thank you, Randy Darnell… my pastor and friend. 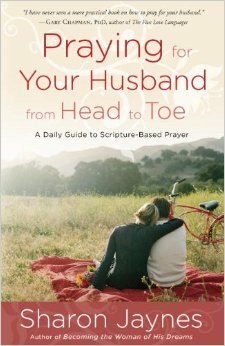 Praying for Your Husband from Head to Toe: A Daily Guide to Scripture-Based Prayer. The book will be released December 17th. You can pre-order your copy now at Amazon. Over the next month or so, I will share this book with you via my blog and My Philippians 4:8 Life Facebook page. I firmly believe that God is going to use this book to encourage women and strengthen marriages for His glory. Check out Sharon’s books at Amazon. Her August release, Knowing God by Name: A Girlfriends in God Faith Adventure is amazing, and it was my first exposure to her writing. Sharon was the vice-president of Proverbs 31 Ministries for ten years, and she is the co-founder of Girlfriends in God, Inc. You can check out her website at www.sharonjaynes.com.